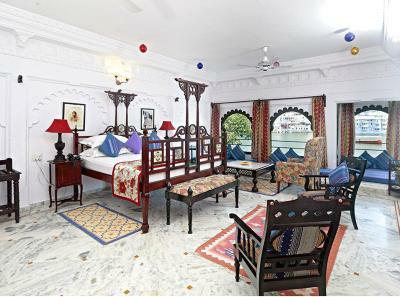 Lock in a great price for Amet Haveli – rated 8.5 by recent guests! THE MOST STUNNING ROOM IN ALL OF INDIA. We stayed in their suite room by the pool - and it was gorgeous with 3 windows that opened up to the bank of the Pichola lake. What incredible charm! The hotel staff was very friendly and helpful too. Pool was beautiful but always busy when we were there. Honestly, our room was so gorgeous we didn't want to leave - perfect for reading, writing, relaxing after spending an outing in the city. Loved the live music at night at dinner. Lake View was awesome . Staff were supportive and cooperative. Stunning location, good restaurant. 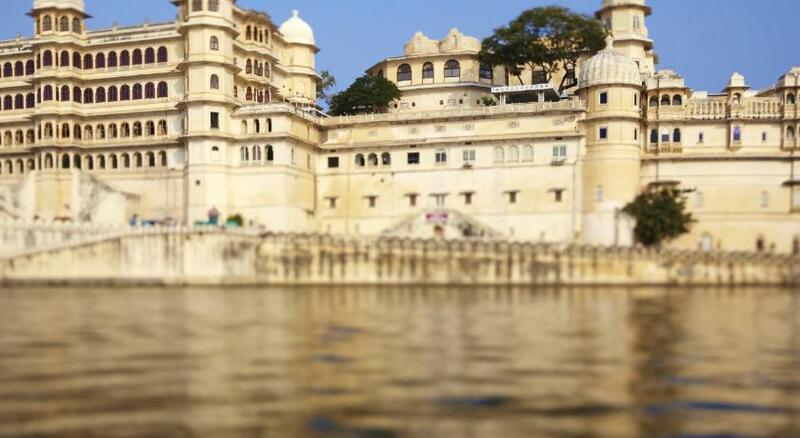 Liked Udaipur as smaller, quieter than other places in India and people didn’t hassle you. The best features are the views and the food in the main restaurant, which is delicious. We also had a fantastic room with amazing views. 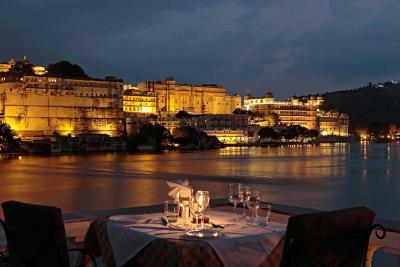 Excellent view of Pichola lake and the City Palace. Restaurant is good and again, excellent view. 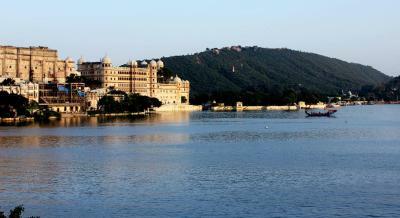 Main sights of Udaipur all in walking distance. Bed was good, shower had hot water. We used the same-day laundry service which was perfect. Staff were friendly, as long as you remember to tip. I enjoyed the breakfast, but looking back it was extremely limited for what is supposed to be upscale. This was one of our favorite places to stay on this entire trip. 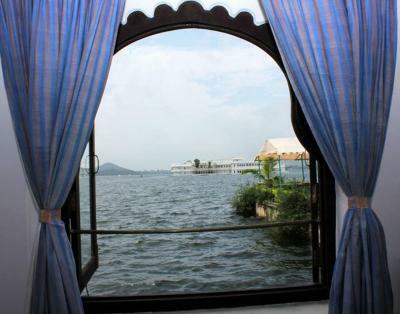 The suite had a view of the lake and both palaces. The staff was incredibly friendly and organized our transport and answered all of our many questions. The room was cozy and beautifully designed. The restaurant food was fantastic, albeit the portions a little too big. It was just so nice to sleep and stay in a place with so much history. 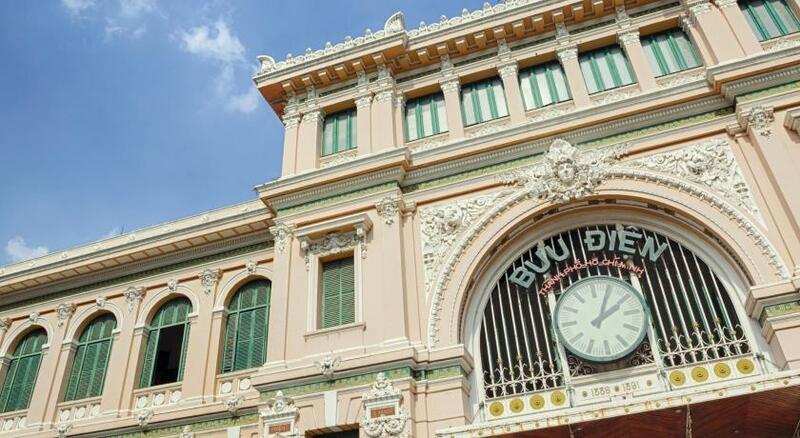 We asked locals and they all said, this is the best place to stay in town. Great location, and the restaurant has an amazing view and good food. The room we had was a lake suite and beautiful, the pool and area was nice and good as it was 38c! The location is superb, great views and veru quiet but so close to the city. 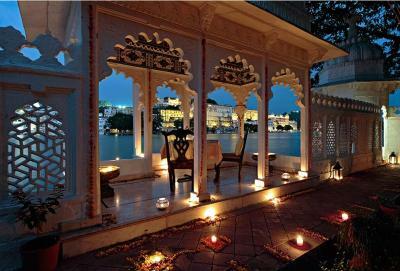 One of our best sellers in Udaipur! 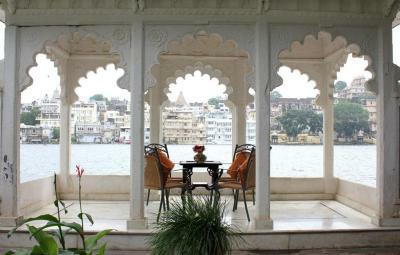 Located in Udaipur, Amet Haveli has free WiFi. Providing a restaurant, the property also features a garden and a terrace. The property provides a 24-hour front desk, and buying tickets for guests. The rooms at the hotel come with a seating area and a flat-screen TV with satellite channels. Each room comes with a private bathroom with free toiletries and a hair dryer. 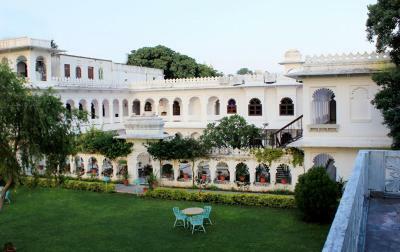 All guest rooms at Amet Haveli include air conditioning and a desk. Guests at the accommodation will be able to enjoy activities in and around Udaipur, like cycling. 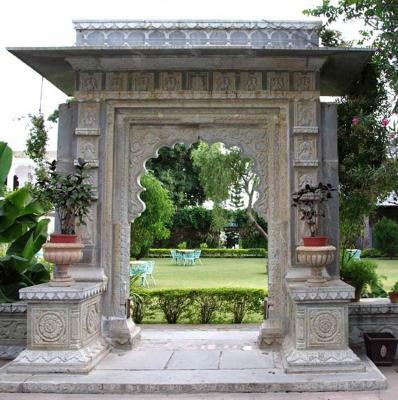 Bagore ki Haveli is a 12-minute walk from Amet Haveli, while Jagdish temple is 0.7 miles away. Dabok Airport is 15 miles from the property. 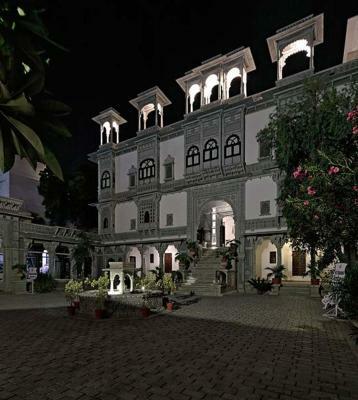 When would you like to stay at Amet Haveli? This suite features a balcony, seating area and view. 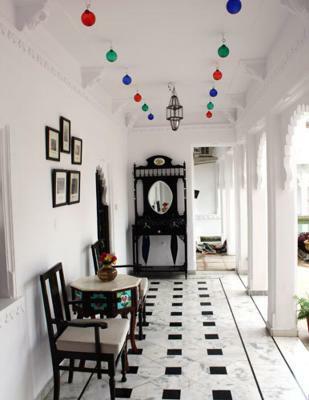 House Rules Amet Haveli takes special requests – add in the next step! Amet Haveli accepts these cards and reserves the right to temporarily hold an amount prior to arrival. The booking procedure, the fact that you cannot reach the hotel with the car (from 9.00 to 21.00) and they don't tell you, the "welcome", very serious people. The on-site spa. Terrible massages, charged a lot more than they initially quoted and my friend had money stolen from her bag. We had changed money just before going to the spa so there was NO doubt about the missing money but also it was easy to see the oily fingerprints on the outside of my friends bag. We complained to management but nothing done, they didn’t want to know. Later we went to a place just up the road which was less than half the price and infinitely superior in quality of treatments. The bathroom drain can be a bit smelly and the pool is a funny colour - otherwise, we love it here and are coming back in October! Manager at reception constantly rude and unhelpful. The guy who organises the taxis looks very shady/untrustworthy. The other, lower ranked, staff were very friendly and helpful when possible. The hotel pretends to be 5 stars but is more like 2 stars. WiFi didn't work at all. Incredibly overpriced, you pay for the view & location. I asked for a late checkout, the manager asked "what time? ", after I said 1pm he said "no, 11.30". What is this, a negotiation? Nothing. Like I said, portions at the restaurant are quite big. But if you're hungry, I guess that's a good thing. Breakfast had limited options but the dinner was fabulous. Loved the view and the food. Getting to the hotel is a nightmare. Those roads are REALLY REALLY conjusted. Kindly replace complementry Water bottle 500 ml to 1000 ml. And cost of 1 ltr bottle is too high. No duvet, only a thin sheet, and quality of bedding could do with improvement. It was a good experience with Amet haveli and Ambrai restaurant... but it would be much better if the hotel includes meal plans with the stay... all reputed hotel do so... At Ambrai so many brands of liquor were only in menu and not in stock... it doesn't go with the reputation of Ambrai...!! !